Hey guys guess what it is FRIYAY! That means we have all survived another week! We are super busy here at Amaretto working on top secret update stuff! Enough about us lets talk about you! It occurred to me earlier today that we do have some community members that do not know how to make a slurl! SLurls and landmarks serve the same purpose. The main difference is that a SLurl is simply a text link, while a landmark is an inventory item type which can only be used inside of SL. You can post a slurl in spam, in note card, or even an private message! If a Amaretto CSR ever answers your ticket with the reply please send me a slurl, I want you guys to be ready! On the page it takes you to, click Visit this location to open it in Second Life. Move your avatar to where you want to create the SLurl. 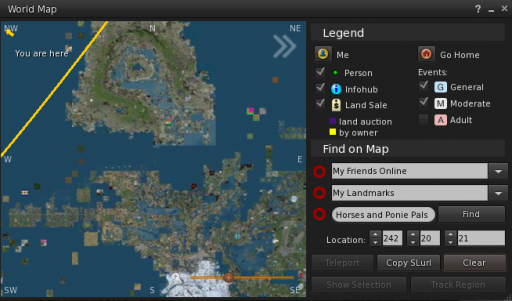 Click the place name in the location bar (near the top of the Viewer window) to convert it to a SLurl. It’ll look like http://maps.secondlife.com/secondlife/Here/128/128/44. Right-click and Copy the SLurl while it’s selected, or use Ctrl+V. Paste the SLurl where you want it. Select World menu > World Map. You can also enter another place on the map, then click Copy SLurl to get a remote SLurl. Right-click a landmark and select Copy SLurl. Click or otherwise use the SLurl to get to its location. Select World > Landmark This Place. The landmark is saved to your inventory. So this is a great secondlife tip i use all the time! Hope this helps some of you guys that didnt know how to make a slurl. Happy breeding everyone this is Ava over and out!